On December 22, President Trump signed H.R. 1, also known as the Tax Cuts and Jobs Act, into law. The legislation, which marks the most sweeping tax changes in 30 years, will affect payroll professionals by changing the taxability of two fringe benefits and affecting income tax withholding in 2018 and beyond. The IRS recently released the new tax withholding tables that reflect the new tax rates for individuals. Lawson has been updated to include these new tax tables. As a result, you may see a change in your paycheck beginning on February 9 for bi-weekly employees and February 15 for monthly employees. No action is required by employees as a result of this change. We will use the W-4 forms already on file to adjust your withholding to reflect the tax changes. However, employees may update their withholding elections at any time by submitting a new Federal W-4 form to Human Resources. In addition to the income tax withholding changes, there are some fringe benefit changes related to qualified moving expenses. Through 2017, the Internal Revenue Code provides an exclusion from employees’ income for qualified moving expense payments and reimbursements made by employers. This fringe benefit will be suspended, except for military-related moving expenses, for tax years 2018 through 2025. Please visit the IRS FAQ site for additional information. As the 2017 calendar year ends, please keep in mind the following important reminders. Now is also a good time to do a personal review of your Federal and State tax withholdings. You can view your current elections using Payment Modeling in Employee Self Service. 2017 W-2’s will be issued by the IRS deadline of January 31, 2018. If you do not elect to receive your W-2 electronically, or you are no longer an active employees, your W-2 will be mailed to the address on file with Human Resources. Please allow 1-2 weeks for delivery via the USPS. We will not be processing any W-2 reprints until Monday, February 12th. If you do not receive your W-2 by February 12th, you may fill out, sign, and email back a completed W-2 request form, which is available on our webpage. 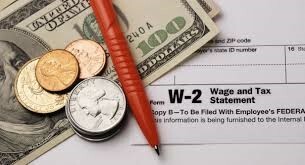 Once we have the form, we will work on processing a W-2 reprint within 5-7 business days.